You might be lucky enough to join a procession of 10,000 ‘ordinary people’ past the Cenotaph. Failing that, if you’re an early bird and live in one of the chosen towns, you’ll be able to enjoy the sound of a bagpipe playing the Battle’s O’er – “a traditional air played by pipers after a battle” – before dawn has broken. After dark more than 1,000 beacons will be lit and “bells in 1,000 churches and cathedrals will ring out in celebration of the end of the First World War”. And if these are not your cup of tea Danny Boyle (of 2012 Olympic ceremony fame) has designed a project where we can all join in. He’s come up with ‘Pages of the Sea’ where, at low tide on 11 November on multiple beaches, “giant portraits of casualties of the war will be carved by sand artists … while members of the public will be invited to create their own silhouettes in the sand of people important to them before the tide sweeps the beaches clean again.”. Possibly going beyond his official remit, Boyle told the Daily Telegraph he chose beaches because they are “dramatic, unruly, democratic” places where “nobody rules but the tide”. We may add that beaches are also prone to pollution by bilge water from vessels that have taken on more than they can handle. Anyway, let’s get beyond the official bilge and set the record straight about how the war really ended. First, it’s not true that the “guns fell silent” on the morning of November 11th 1918 while Marshall Foch negotiated the Armistice with the German High Command. For various reasons, the fighting continued on many parts of the Western Front. It’s reckoned that over 10,000 men were killed, wounded or went missing on that day. A day like any other day, then, in a war which is now estimated (nobody really knows) to have mobilised about 70 million men, killing around 9-10 million of them and leaving over 35 million more wounded, imprisoned or ‘missing’. But there’s an even bigger gap between fact and fiction, in this annual recital of a national myth. In reality, after the February 1917 revolution in Russia soldiers on both sides on the Western front were questioning what they were fighting for. Possibly the biggest Allied mutiny was by French soldiers in mid-1917 (involving 54 divisions and raising the cry of ‘peace or revolution’). Afterwards four British cavalry divisions were installed in France for the remainder of the war, with orders to “break strikes and anti-war agitation”. But that’s not part of the national myth, any more than acknowledging that, despite draconian punishments, including the death penalty, mutinies by British soldiers and sailors mounted each year to more than 13,000 in 1917. By 1918 the working class on both sides had had enough. It was the political hold of the kings and emperors of the Central powers which collapsed first as the anger of mutinous troops and half-starved populations turned from demanding an end to the war to outright revolution. They were inspired by the Russian Revolution and Bolshevik calls for workers elsewhere to rise up and create a world soviet republic. Armistices had already been signed by Bulgaria, Turkey and Austria-Hungary before 11th November. 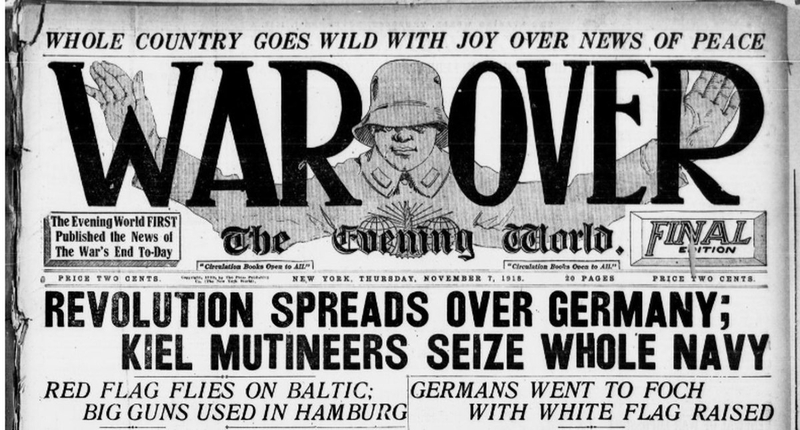 It was only because the Allies wanted unambiguous surrender from Germany that the war continued. The delay only encouraged the formation of workers’ and soldiers’ councils throughout the land. ‘Kaiser Bill’ saw the writing on the wall and ran away to the Netherlands. Meanwhile the Social Democratic Party took over in Berlin and Philipp Scheidemann announced that Germany was henceforth a (parliamentary) republic before the councils could proclaim their own soviet republic. Working class uprisings had stopped the war between the ‘great powers’ before 11th November. Now the capitalists were more concerned to save their economic system based on profits produced by wage labour from communist revolution than to wage war with each other. In April 1918 the Allies had invaded Russia in order to crush the revolution. This campaign continued after the Armistice. For them, defeating the revolutionaries threatening capitalism was now more important than the war against each other. Britain and France only withdrew from the Russian campaign in April 1919 because of the strikes and mutinies of soldiers and sailors, many of them sympathetic to Bolshevism and who refused to fight. In January 1919 a ‘strike’ at British army bases grew into a massive mutiny of more than 20,000 troops. With the support of locals, they took control of British army headquarters in Calais. General Byng was sent to put down the mutiny but his troops refused to fire and the army was forced to concede demands for improved conditions. Like the mutinous soldiers of the French Black Sea fleet, these troops were not going anywhere near Russia. Within Britain the same issues were in play. There were no victories for the working class to celebrate. After the Armistice tens of thousands of battle-weary soldiers found themselves stuck in filthy barracks, still subject to harsh military discipline for months on end as they waited to be de-mobbed. This was one of the biggest causes of the frequent mutinies which occurred after the war, but it was by no means the only one. (Increasingly, soldiers and sailors resisted being used to put down ‘Bolshevism’.) One of the earliest mutinies occurred in January 1919 in Folkestone – where Danny Boyle’s crew will be tracing figures in the sand on 11th November – where two thousand troops refused to be herded back to France and led a procession of ten thousand or more through the town, cheered by the local population. Lloyd George’s “land fit for heroes” was a long way from reality. The soldiers-just-out-of-uniform were returning to join a malnourished, poorly-housed, over-worked working class still facing severe food shortages, price hikes and bread rationing. Increasingly many would be without a job but as yet there was a revived militancy (even the police had been on strike in 1918) and belief in a better future within the working class as the optimism generated by the Russian Revolution held sway. But the British state was more prepared to nip any move by workers than the working class was ready for socialist revolution. Aside from the military divisions ready to combat ‘domestic unrest’ (as in Glasgow in 1919) and the plans to introduce martial law and detain “suspected troublemakers” (as Sylvia Pankhurst was in October 1920) if necessary, British capital had a relatively sophisticated political system which it could adapt to pull the wool over working class eyes. Before the war was over, parliament had passed the Representation of the People Act to provide a democratic cover for the rule of capital. For the first time all men over 21 had the right to vote. The much-lauded ‘votes for women’ only applied to women over 30 who were graduates and/or whose husbands owned a certain amount of property. The hastily organised ‘Khaki election’ of December 1918 – long before most soldiers had returned home and after a short 3 week campaign mainly about war reparations, punishing Germany and repatriating enemy aliens – presented no social programme whatsoever. Unsurprisingly there was a very low voter turnout, but it served Lloyd George’s scheme for a Liberal/Conservative coalition government and neatly kept the new democratic political debate on the same old ground of the class that had taken Britain into the war. On this national parliamentary ground there was no room for debate about a new communist society where the working class could exercise power via a network of directly-elected councils (or soviets) and manage production directly to meet social needs. Even before the Labour Party myth that state control of industry is a step towards socialism, the extension of the right to vote enabled Lloyd George’s Liberal/Conservative coalition to claim democratic legitimacy for the British capitalist state. It undermined (though did not extinguish) the natural sympathy of workers in Britain for the achievement of the Russian working class. Britain in 2018 may seem a far cry from 1918, but on November 11th – when the last post has sounded, the beacons are lit and the sand drawings have been washed away – we would do well to remember that the war was an inter-imperialist one for aims that had nothing to do with the working class. It was the first in this epoch of global capitalism: when the cyclical economic crisis can only be resolved by the fight of the major powers to destroy each other’s economic base. In 1918 the United States benefited from the weakening of British imperialism. In 1945 the US emerged from another world war as the world’s supreme economic power. Today, as world capitalism faces yet another unsolvable crisis and the US is positioning to face off the competition from rising China, the prospect of trade wars eventually turning into real wars is again a reality. The last thing workers need to be doing is commemorate the slaughter of previous generations in what one first world war veteran – Harry Patch – poignantly described as no more than “organised murder”. More than ever, the only civilised prospect for humanity is for an end to capitalism and its class-divided society. As a starting point, we can only repeat, more than ever today: The only war worth fighting is the class war. The above article is taken from the current edition (No. 45) of Aurora, bulletin of the Communist Workers’ Organisation. msn.com A true European Army to defend against the USA, Russia and China. Hegel may well have been right when he said "We learn from History that we do not learn from History." Wasn't it "we learn history but we do not learn from history"? And of course in this case bourgeois ideology is deliberately distorting history for its own nationalist agenda. Well, judging by the many instances of my version on the internet, I will stand by it, but I am no expert on Hegel. I hope he was wrong! „Wir lernen aus der Geschichte, dass wir nicht aus der Geschichte lernen.“ ..
Perhaps the translation is naff - if you look at the German above (not one of my languages or yours I believe) the word order suggests some ironic reversal- but yes, let's hope the old git is not always right on this. Greater love hath no man than this, that a man lay down his correct translation for his friends. Of course, a popular version of this is to be found on many WW1 monuments. Donald Trump has hit out at a call from French President Emmanuel Macron for the creation of a “European Army” to protect the continent from China, Russia and the US – labelling the idea “insulting”. Earlier this week Mr Macron called for the creation of a “true European army” to allow the EU to defend itself from threats including Russian President Vladimir Putin and President Trump. Yesterday, Sunday, was the day of the highest mass in Paris. Macron's sermon, where the officiant raised the issues in the dramatic terms with which the European bourgeoisie lives at the moment, pinched between the US trade war and the fear that a new nuclear race between the US and Russia will condemn it to obedience to the Americans. But, why so much drama? After the elections in the USA, the debacle of Trumpism to which much of the European bourgeoisie relied on its strategy, did not transpire and the situation is more dangerous than ever for European capital. US punitive tariffs against the European automotive industry are imminent. The summer truce is exhausted. The EU wants to resume negotiations at the beginning of 2019, aware that the signing of the new US trade agreement with Canada and Mexico is imminent and that once that front is closed, the American negotiators will draw up Europe's direct import space for them. After all, the Mexican automotive industry is, fundamentally, the reterritorialization of the German industry with all its auxiliary industry. It is not surprising that the atmosphere within the German bourgeoisie is becoming increasingly pessimistic. Very significantly, Trump, who attended the parade and the celebrations, did not go to the "Peace Forum" of Macron and Merkel. He is not going to fall prey to cries because of "multilateralism" and he plans to continue to provoke – nor does it even cost him too much - the dissent of the EU, starting with Brexit. The false opposition between patriotism and nationalism of Merkel, that is to say between nationalism aligned with the Franco-German imperialist interest and rebellious nationalism in the Italian, Polish or Hungarian style, confesses Franco-German impotence to discipline the continent and create the block that until not so long ago was presented as alternative. Let's not forget what they celebrated yesterday. A century ago, the German revolution put an end to the greatest slaughter in history to date. Capitalism closed the doors on its progressive stage leaving over 14 to 30 million corpses over Europe, a whole generation of young workers. The armistice they celebrate today was not "peace", which could only have arisen from the overcoming of capitalism, but a truce to defeat the Revolution and continue to wage war. As it is today. We continue in the same terms: "peace", "multilateralism", the "European project" are just increasingly shameless masks that try to dress the desperation with which European capital seeks markets and placements for a capital that has been a burden and a danger for humanity for 100 years. Bravo Stevein - have passed on to NC.